So, you’ve finally saved up enough to buy the guitar of your dreams? You might as well walk the extra mile and make sure that you’ll get to use this guitar in a perfect condition for a long time to come – the best way to go about that is to invest in a quality case for it!Many high-end guitars come with their own cases which are custom-made for that specific guitar, but in case you don’t have one, there are numerous options you can choose from – so make sure you look at everything carefully before settling on a decision in the end.Chipboard cases are usually the cheapest variants available – they’re made in a way that offers the least protection, and are suitable for guitarists who mainly keep their instruments at home, and only take them out rarely. 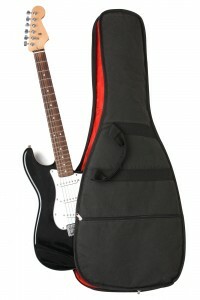 You should be very careful when transporting your guitar in a case like this because it will likely not take a strong impact very well.Gig bags are the all-around choice because they offer a balanced combination of portability and durability, as well as convenience – they commonly feature a shoulder strap that makes them more comfortable for carrying, and they come in different configurations, from light ones that provide relatively little protection, to more advanced models that offer serious protection from damage. Gig bags are also quite varied in terms of appearance, and they come in various configurations of colors and sizes. Hard shell cases are meant for guitarists who really want to invest in something that will protect their guitars against most types of random damage – they’re also made in configurations suitable for pretty much all kinds of guitars out there. It’s very important that you get a case that fits your own guitar perfectly though – hard shell cases only offer adequate protection when they match the shape and size of the guitar itself properly. 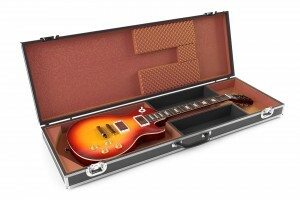 Flight cases are a special type of guitar case, ideal for those who’re always on the move – they’re typically extra padded against damage, and are made to offer a good degree of protection while also being easily portable. They’re sometimes heavier than you’d expect, but usually come with various portability features that make it easier to carry them around, which usually compensates for the weight and makes these cases ideal for you on long trips without worrying that your instrument might get damaged during its transportation at some point.